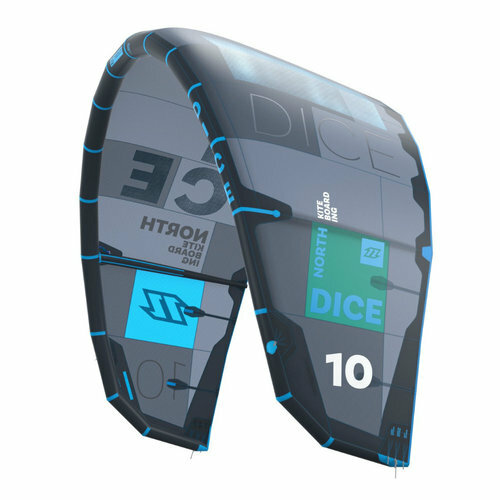 The New 2018 North Dice is a freestyle/wave riders dream. The DICE is a perfect kite for those who love freestyle and cannot manage to stay away from a good wave ride, this kite would have to be in your quiver. For 2018 there are some updates that are worth mentioning; the goal was to still maintain and create a modern kite with a slight delta shape to make it a progressive freestyle kite for advanced riders, as well as an easy kite to slip onto the waves now and again without compromise. There was an extra panel added between the center and quarter strut, increasing the radius profile of the kite. Also, they compeltey reworked the leading edge increading the structural stiffness in the wind tip area. 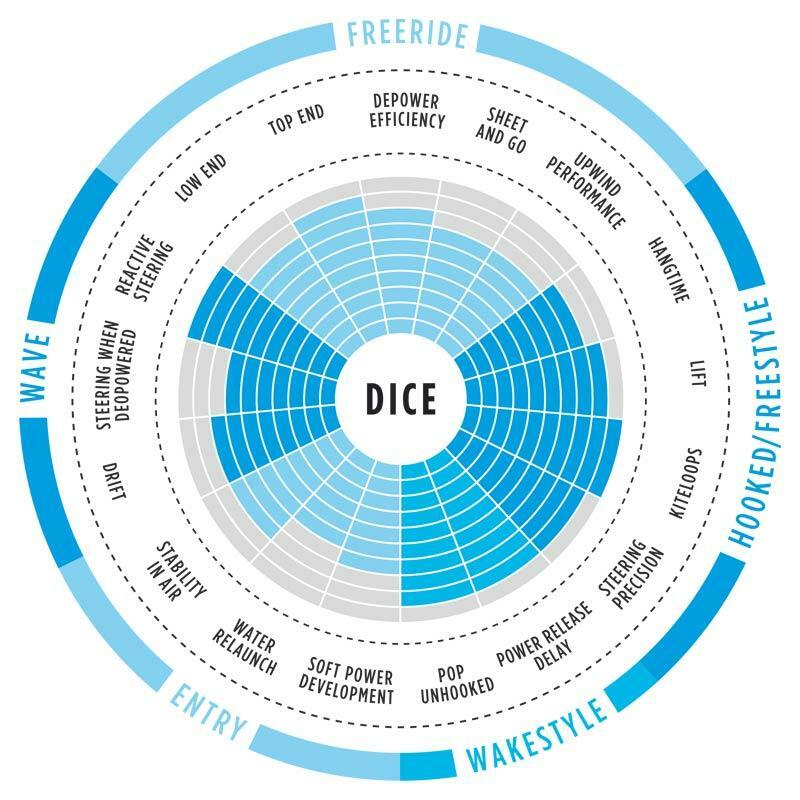 These changes unoticed to the naked eye have imcreased the dynamic handling the the North Dice has always been famous for and will not let down even the most progressive freestyle riders. The steering this year is even more respnsive, giving you bigger boosted jumps and easy controled loops. The POP given by the Dice is explosive, giving a good amount of slack for unhooked tricks also. The North Dice is the the only kite in their range combining outstanding pop and release for freestyle with active handling for waves, Please the kiter in you that wants it all! For 2018 North Kiteboarding has taken the canopy material to a whole new level. Trinity TX is the most advanced fabric material on the market, and exclusive to North Kiteboarding. Its a premium quality material built to last. Super strong and resilient to rips and tears. Combined with Teijin, the worlds leading supplier of polyester fabric and sail materials in marine sports today and North Kiteboarding, Trinity TX was born. It is a 3x2 canopy material, and has been proven to exceed any other canopy materials in terms of dynamic performance and durability. The 3x2 yarn is covered and protected before being woven into one fabric, is proven to be the best solution in terms of performance and durability. Overall, remarkable better to any 2x2 or 4x4 yarn solutions. TRINITY TX, was made to stand the test of time! The double coating process of the new Trinity TX creates a very direct and crisp response to turning, and enduring a long term durability and heavy resistance to the harmful UV rays, and also from sand, salt, stones and other hard objects. The double coating process of Trinity TX creates a crisp and very direct response to steering, ensuring long term durability and strong resistance against any environmental factors such as UV. The unique coating procedure ensures that each individual yarn is covered and protected before being woven into one fabric. The additional second coating then protects the canopy as a whole, safeguarding the crisp texture of the material for longer. This process not only keeps the canopy material protected from the sun’s harmful UV rays, but also from salt crystals, sand, stones and other sharp objects.